My main occupation is Neuroscience. In the past, I have been interested on how the visual system processes natural scenes. To this end, I have recorded naturalistic movies using micro-cameras carried by cats while they were actively exploring a natural environment. I used these movies to train neuronal networks in an unsupervised manner and compared learnt features to the known properties of neurons in visual cortex. I also used these videos as stimuli during physiological recordings to gain insights on the principles of natural signal processing in the visual cortex. Recently, I started working on how humans make generalizations based on what they have previously learnt. To this end, I am using a variety of methodologies including fMRI (1), autonomous (2), as well as eye-movement recordings (3). This research emanates from the well-established field of "stimulus generalization" following mainly the "lineage" of Hovland, Hull and Roger Shepard (4), and including the more recent computational work of Josua Tenenbaum (5). Furthermore, it integrates work on anxiety disorders, as it is believed that these mechanisms are impaired in people suffering from anxiety problems. Generalization of aversive events to previously neutral events relates to problems in anxiety regulation. This is generally investigated by using simplified stimuli that are parametrically modified to span a similarity space with respect to the aversive event and measuring the tuning width of autonomic responses. However on the neuronal level our knowledge about which brain regions underpin this generalization is scarce. 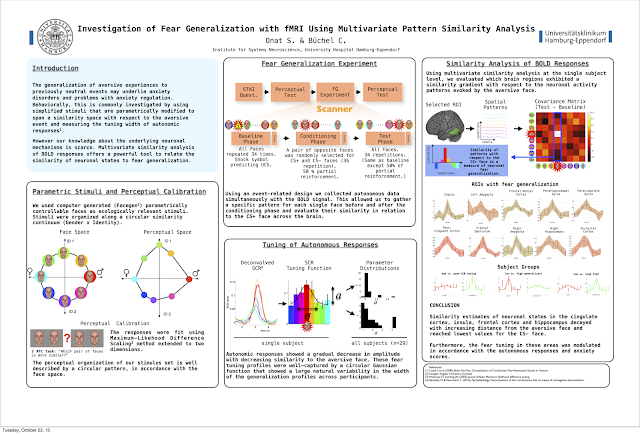 Multivariate pattern analysis of BOLD responses offer a valuable tool to investigate brain regions which are responsible in controlling the fear generalization. We investigated fear generalization using faces as ecologically relevant stimuli using an event-related fMRI design using healthy humans. These stimuli were organized along a circular similarity continuum and two opposing faces were randomly selected as the aversive and neutral face for each participant. Autonomic measures of anxiety such as skin conductance and pupil size showed a gradual decrease in amplitude with increasing distance to the aversive face. 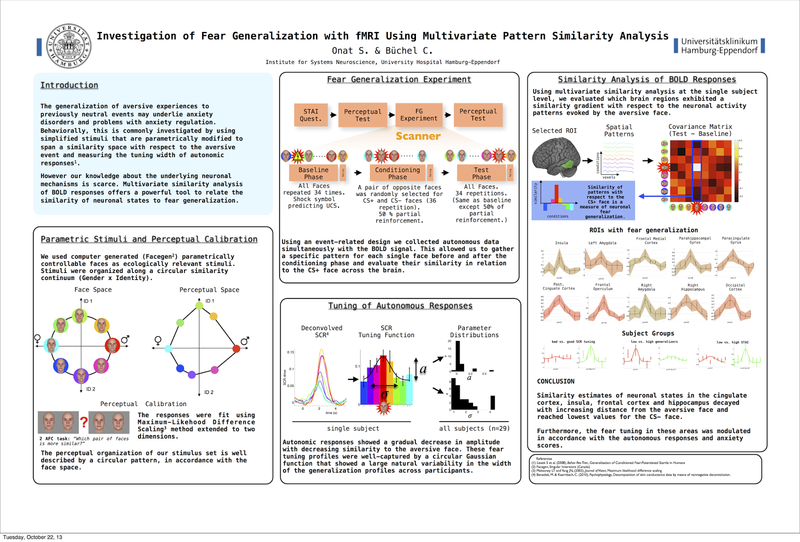 These fear tuning profiles were well-captured with a circular Gaussian function that showed a large natural variability in the width of the generalization profiles across participants. Using multi-variate similarity analysis at the single subject level, we evaluated which brain regions exhibited a similarity gradient with respect to the neuronal activity patterns evoked by the aversive face. In cingulate cortex, putamen, insular cortex and frontal regions, including medial frontal and orbito-frontal cortex, the similarity of neuronal activity patterns decayed with increasing distance from the aversive face and reached lowest values for the neutral face. Our current results extend our current knowledge about fear generalization and most importantly provide new tools to investigate neuronal sites that are responsible for anxiety regulation.